Many people have trouble keeping all the clothing, detergents, fabric softeners and hampers in their proper places in the laundry room. Too often, laundry rooms can serve as a catch-all area for all kinds of items that don't belong there, including shoes, tools and sporting equipment. Get your laundry room organized to ensure you never have to wonder where something is again. Before you can organize the laundry room, take the time to clean it out. Remove the items that don't belong. Fold and put away any clothing that has been left to sit. This step can even be fun for some since they'll discover that dress they wanted to wear last month or that grey sock that had been missing since Easter. Put any dirty laundry that's on the floor or piled anywhere else into a sturdy hamper. Place the hamper outside the room for now. Put detergents and other cleaning items in a box and place them outside as well. Depending upon the size, shape and dimensions of your laundry room, you may find a number of different ways you can organize it. Breaking the room down into separate storage areas will help you determine what sort of organizing materials to buy. Use the space directly above the washing machine and dryer for shelves, hooks and wall baskets. Get wall-mounted hooks or a closet bar to use to hang dress clothing that belongs in the closet or clothes waiting to be ironed. If you don't have space for your ironing board, buy one that attaches to the wall. Just pull it down when you need to use it. Consider pouring your detergents into a wall mounted dispenser and get rid of those large, bulky bottles. Get wire shelving to hold detergents or line wooden shelving with plastic sheeting so it's easy to clean up any drips. 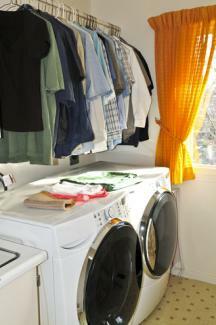 Store items below the washing machine and dryer with the help of a pedestal. Buy clothes racks or thin carts to keep between the two appliances if there is a significant gap. Purchase a cart you can store in a closet when you're not using it to hold large items like detergents, or seldom used items like specialty stain removers. Purchase a small trash can to place next to or above the dryer so that you can throw away the lint from the filter, plus any items that fall out of your clothing's pockets. Buy one stackable laundry basket for each household member. They can use the baskets to bring their clothes for washing instead of hampers. You can stack the baskets when you're not using them so they take up less space. If you have a laundry chute, purchase a short and wide basket to place at the bottom of it. It will keep the dirty clothes from ending up on the floor. Once you've got an idea of where you want to place things and what you need, consider shopping at these retailers. They have all the items you'll need to pull the room together. Stacks and Stacks has a large selection of laundry room storage, including shelves, roll out carts, wall hangers and baskets. 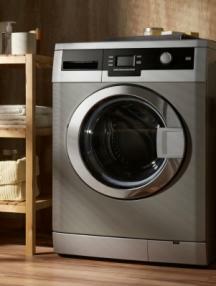 They also carry linen towers and shelves designed to fit right between the washer and dryer to fit all bathroom sizes. Ikea has a full line of laundry room organization systems. These modular systems including boxes, baskets, hooks and shelves you can use to get exactly what you need in your laundry room. Use as little or as much as your room will hold. The Container Store has dozens of different products to make organizing your laundry room a breeze. From their customizable shelving options to their wall solutions for storing irons, ironing boards and detergents, they have items for every area of the laundry room. Bed Bath & Beyond has stackable laundry baskets, wall and floor shelving options, as well as roll out carts that include hanging bars so you can transfer your clean and dry laundry right to their destinations. Crate&Barrel carries a modular laundry room shelving system. Included in the system are wall and floor shelves, containers, hooks and boxes you use in combination to organize the space. 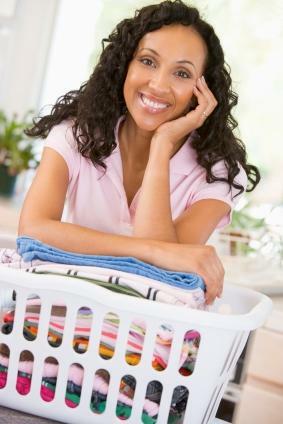 Wash clothes as soon as they arrive in the laundry room. Fold the clothes as you take them out of the dryer instead of letting them sit either in the dryer or on a table. Put folded clothes directly into a laundry basket. Take the clothes right out of the laundry room and put them away immediately. If you can keep the clothes clutter at bay, maintaining the rest of the room should be a cinch. All you have to do is put items back where they belong when you're finished using them. Then you'll be able to find them quickly next time you go to do your laundry. A well-organized laundry room will help make your days a little bit easier. Take the time to set up and organize the space and see how much more you can get out of your laundry room.